Occasionally I revisit a significant photograph from the past. 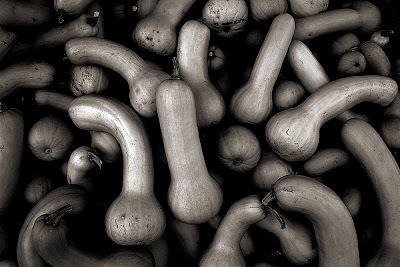 This one of a bushel of Butternut Squash was taken just after leaving the Fryeburg Fair in western Maine. The weather outside was frightful or threatening to get that way fast. There was a gentle mist at the moment the image was made. The even light produced lovely mid-tones and tremendous luminosity. The richness of this image sealed my decision to go digital from capture to print. That was late September 2003.